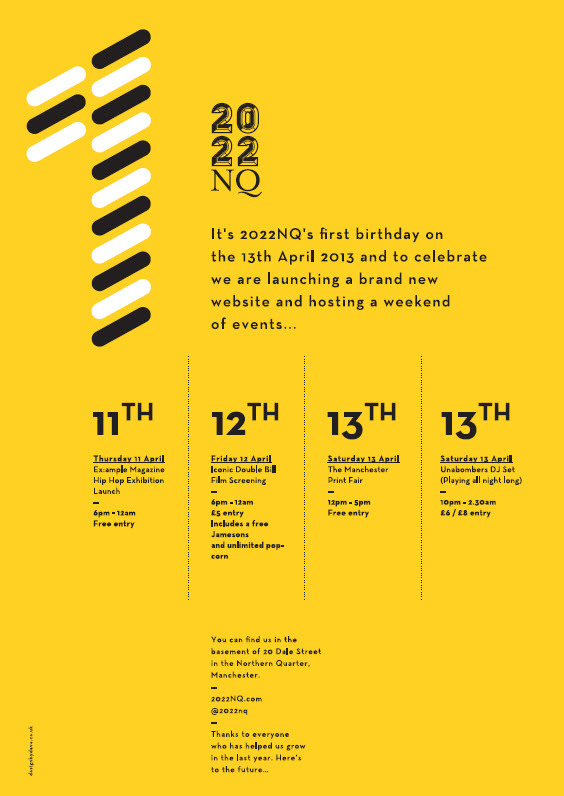 Hot Mancunian venue 2022 NQ celebrates its first birthday in April 2013 after a memorable twelve months establishing itself as the cultural hub in the UK’s second creative city. The venue has been built on a commitment to Music and Arts in the North West by adopting a simple mantra – CreateLearnExhibitWork. The space’s appeal lies in its versatility for each of these purposes, thus becoming a centre-point creative’s of any discipline and interest can relax, engage and work. Proceedings kick off on the Thursday with the ‘Ex:ample Magazine Hip Hop Exhibition Launch’. 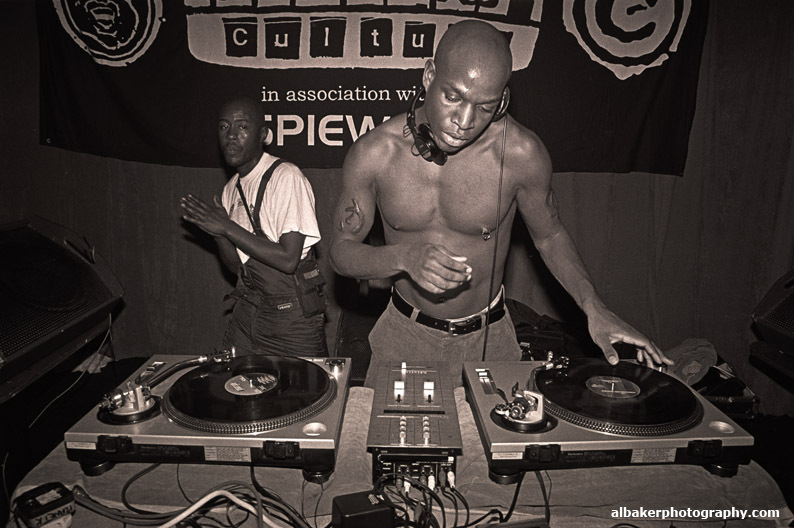 The launch of this retrospective exhibition focuses on the theme of hip-hop, and will showcase photography from some of the best Ex:ample contributors, including Air Adam, Al Baker, Gary Brown, Jody Hartley and James Mernagh. The exhibition will capture the nostalgia and atmosphere from some of the best and most memorable moments of b-boy culture in Manchester, and will be accompanied by several special DJ sets. The following day sees the birthday celebrations continue with a special double bill film screening of two of the more alluring recent films on popular music. The critically acclaimed LCD Sound System’s final live performance, 'Shut up and Play The Hits' will be preceded by ‘Iceland: Beyond Sigur Ros’, produced by Manchester indie film outfit, Serious Feather. DJ support comes from the Generic Greeting Collective, with entry including a free Jamesons whiskey and unlimited popcorn. Then on Saturday a double header of daytime and evening partaking is incorporated into the mix. The sunlight hours (we hope, it is Manchester) are bolstered by the presence of the third installation of The Manchester Print Fair, featuring over twenty local and regional artists, designers and crafters. Original handmade prints will be on sale, as well as live screen printing workshops for those wanting to indulge their creative curiosities. Then the midnight oil burns for a very special Unabombers All Night DJ Set later in the evening. The Unabombers are Luke Cowdrey and Justin Crawford, Mancunian legends with an indelible heritage in the city’s music scene. They are the masterminds of the legendary Electric Chair club night, Croatia's Electric Elephant and the publicsocialhousecafebar, Electrik. Together they cultivated a house and disco-rooted but open-minded dancefloor aesthetic, drawing upon techno, hip-hop, broken beat, R&B and Latin sounds. 2022NQ will be giving them full musical reign for the entire evening, ensuring an eclectic journey through the most lustrous and soulful recesses of dance music.